With about 6,000 species, the class Anthozoa includes about two-thirds of extant cnidarian phylum. But unlike other cnidarians, anthozoans do not have a medusa stage in their development. Some of species harbor a type of algae (dinoflagellates called zooxanthellae), with which they form a symbiotic relationship. 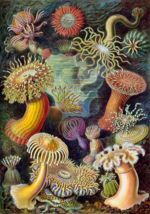 Anthozoans are also known as flower animals of the sea for their lustrous, rainbow-like colors. Subclass Alcyonaria includes animals such as soft coral, sea fan, sea pen, and blue coral. Each polyp has eight tentacles that are pinnately branched. 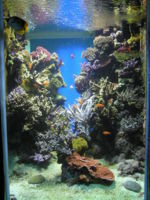 Subclass Zoantharia includes animals such as sea anemone, stony coral, and black coral. Even though the name of the subclass means it has six tentacles, most of members don't have six tentacles. 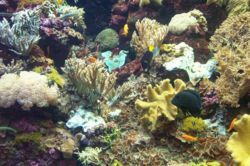 Rather, zoantharians typically have a multiple of six mesenteries and tentacles. It was created on the 5th day of the creation. All anthozoans can reproduce sexually and some can also reproduce asexually. Sexual - Organisms in the Anthozoa class can reproduce sexually by forming eggs and sperm, which fertilize like the other organism classes in Cnidaria. Asexual - Anthozoans may reproduce asexually by budding or by dividing themselves in half. This page was last modified on 28 October 2011, at 20:33.